Firing your best bullet, and other thoughts on rare earth mania. A brief list of commodities of which China is a net importer: oil, iron ore, soy beans, wheat, corn, aluminum scrap metal, copper scrap metal, steel scrap metal, recyclable paper stock. That is to say, China lacks sufficient domestic supplies of these resources, and must resort to other countries for supply. Among the leading suppliers of food commodities and scrap metals (which comprise a significant percentage of China’s total production of aluminum and copper and, to a lesser but still important extent, steel) is the United States. Indeed, as China’s economy grows, it’s dependence upon the United States and other exporters for commodities, especially for food and metal (and ores) increases. 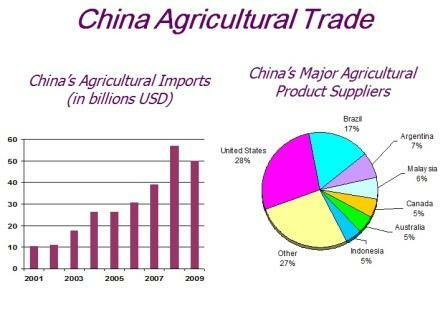 Below, a chart from the United States Department of Agriculture’s Shanghai Trade office. Quite often, and understandably, my friends in the China-focused media and academic class tend to lose themselves in the same story and theme. For years, for example, the China-focused media has been tightly focused on the Chinese export story, while giving short shrift to the still considerable volume of exports – especially the commodities that power the Chinese export machine – that the United States and other developed countries send to China. To be sure, the trade deficit between China and the United States grows, but US to China trade also grows, and it’s worth remembering – if the stories about American job losses often don’t – that China is the third largest US export market. And it’s also worth remembering that commodities – agricultural and recyclable – are the two leading US exports to China, by volume. Which brings me to the recent intimations of a ban on the rare earth elements so crucial to the manufacture of (ahem) ipods, disk drives, catalytic converters, wind turbines and the navigation systems of Abrams tanks – all items, we are told, essential to the function of modern life. One can’t underestimate the importance of rare earths. Six years ago, in the midst of a global commodities boom that raised prices on scrap metals across the globe, US-based consumers of scrap steel formed a coalition to press for a total export ban on the material (2/3 of US steel production is scrap based). They were soon followed, in their complaints, by US-based consumers of other scrap metals. In both cases, the bogeyman was China: if not for its protectionist economy, the argument was made, American scrap consumers would be able to buy their material at “normal” prices. In fact, there was almost zero chance that the free trade-oriented Bush administration would slap an expo ban on scrap. But that didn’t stop Chinese importers of the material, and their trade associations, from going into full-tilt panic mode at the prospect of restricted trade in a raw material key to China’s growth and employment picture. I personally witnessed the panic and hyperbole, as well as the relief when the proposals were set aside. In fact, just this April I was in a room when a Chinese trade official thanked a US person involved in that incident for his help in defeating the proposed ban – and that was six years on! For all of the posturing by Chinese policymakers, the truth is that China’s growth story is highly, unambiguously, dependent upon commodity exports from abroad, and there isn’t a Beijing bureaucrat worth his salt who doesn’t know it. Now, whatever China is trying to accomplish with a rare earth ban (and that’s assuming there is, in fact, a ban), it can’t be lost on economic policy-makers in Beijing that a retaliatory export ban (however unlikely) on something like – I dunno – soybeans or aluminum scrap, would have a far more profound and immediate impact upon the Chinese economy than this alleged rare earth ban (a ban that can be circumvented by packing a suitcase with rare earth powders sufficient to run relevant manufacturing facilities for years) will have on the US. Now, I’m neither advocating such bans, nor do I think them wise. But, fact is, there are new calls for a scrap metal export ban in Washington, D.C., and the rare earth export ban guarantees that ears will be more open to a ban this year, than they were in 2004. Way to go. This entry was posted in Scrap, US-China Policy by Adam. Bookmark the permalink. Re: scrap metal. Adam, do you know what percentage of goes to China and what percentage goes to, say, India? A blanket US export ban would hit all other industrializing developing countries as well — and they may get hit harder by the rising prices. Re: rare earths in a suitcase. My understanding is that exports of refined rare earths are continuing as before. Semi-refined ores are the subject of all this hullabaloo. Aren’t these pretty bulky? I’m thinking container bulky — i.e., too bulky for suitcases, but not bulky enough for bulk carriers. Now that American and European importers have spoken up, it does seem as though the Times jumped the gun when it linked an export ban to the trawler captain hysteria. Perhaps Japan, as the largest importer, simply got hit with it first. The existence of the quota makes this whole mess even more difficult to interpret. Could this “halt” be a pause — to stretch the quota to end-of-year? It’s one of the more confusing news stories I’ve followed, that’s for sure. We’ll know for sure in a couple of months, when the 2010 trade statistics have been added up. If rare earths come in under quota for the year, then — bang! That’d be the smoking gun that’s been missing all this time. The recent rare earth mineral export difficulties with China allows other countries to issue country specific export bans to China according to WTO rules, and doesn’t require a blanket export ban. Countries can also ban specific raw material or product as well. But anyway, I am glad that this rare earth mineral export difficulty happened now, and not later. Right now, the rest of the world still have sufficient store of the stuff to last at least a few years, to allow time for other countries to resume mining and refining, to ensure world supply. It also ringed the alarm bell to the rest of the world what kind of supplier China is, and make steps to assure supply in other areas too, like toys for children, disposable chopsticks, and work clothes. Other third world country should be able to take advantage of this incident to market their products, not as a cheap alternative to Made in China products, but a more secured supply. This will help the economy of the third world countries a lot. This incident should also be a warning to those foreign investors in China, that what they have invested may not be so secure after all. Tom– Tech Metals blog posted earlier today a list of scenarios that could lead to the interruption in rare-earth shipments from China. These range from the popular embargo theory to more likely situations stemming from the manner in which the quota-system is managed. There’s also a very helpful graphic that compares historical export quotas to demand outside of China. Until 2010, these were more in sync. As a whole, China is, by far, the largest market for scrap recyclables. But there are lots of categories, so it’s a tough breakdown. Still, based upon my own knowledge of the markets – well over half of the major scrap recyclables that the US exports (aluminum and copper being the most important) go to China. Canada remains a strong second in some categories, but I have to think NAFTA would protect them to some extent if a blanket ban were placed on the items. Jen and Adam — very informative. Thanks!